Pictured left to right are Nicole Forsythe, Sue Bissonnette and Steven Bissonnette. 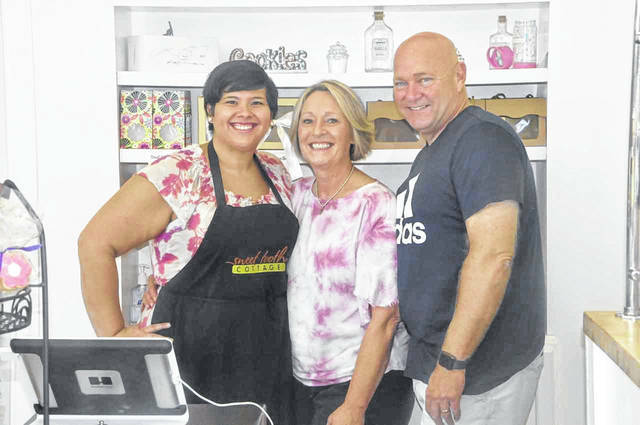 The trio represent the leadership of Sweet Tooth Cottage in Powell. Sweet Tooth Cottage owner Sue Bissonnette fills an order for a customer. Tucked into a small strip mall on the corner of Presidential and Sawmill parkways, the location of Powell’s Sweet Tooth Cottage could be best described as inconspicuous. But while the location of the shop itself might not grab a passerby’s attention, one visit to the shop might do the trick. Upon walking through the door, a customer’s eyes are immediately directed to the array of baked goods separated by glass cases before them. From cookies to cupcakes, cake bars to buckeyes, Sweet Tooth’s selection of treats aim to please the preferences and unique taste buds of every customer. But perhaps even more pleasant than the delightful sites and aromas that greet you upon entrance are the warm and welcoming personalities of the people responsible for producing them. 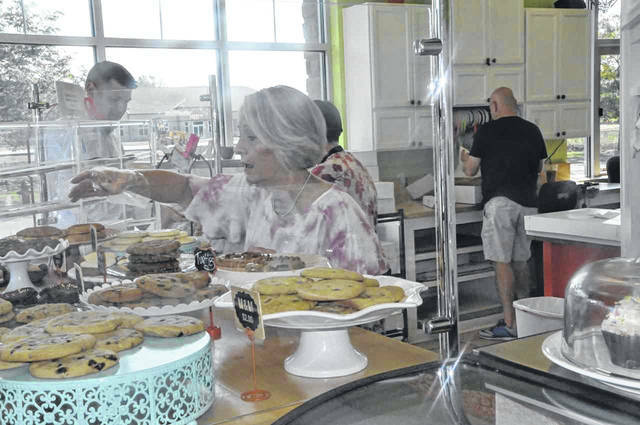 Sue Bissonnette, owner of Sweet Tooth Cottage, has always had a passion for baking. Naturally, that passion became the foundation for her very own bake shop years ago when she began the business out of her own home. Bissonnette, a dental hygienist at the time, would take orders for her friends, whether it be for parties, tailgates or work-related functions. The orders were strictly for her butter cookies, which, even with an extensive product offering today, are still a staple of the shop. Bissonnette ran her business out of her home for 10 years, but as her client base and the demand for her products continued to grow, the need for a dedicated space became paramount. Bissonnette’s husband and co-owner, Steven Bissonnette, who handles everything from marketing to baking, recalled with a laugh how the business began to take over the space of their home, boxes stacked to the roof in some rooms. The move to a retail location, he said, wasn’t so much a decision as it was a forced step in continuing her business. With business booming, Sweet Tooth Cottage was opened at 10221 Sawmill Parkway in January of 2013. The name, Sue Bissonnette said, is a nod to both her days as a dental hygienist and the shop’s roots as a home-based cottage business. Today, Sweet Tooth serves a multitude of clients. Sue Bissonnette said her first big break came when the business was still being operated from home when The Hills Market began selling her cookies. Since then, Sweet Tooth has become a preferred baker for The Ohio State University, providing treats for the Ohio Union and various departments within the school. “The Ohio Buckeye Candy Trail is a great representation of the success that can be achieved when destinations and small businesses collaborate,” said Deb Shatzer, executive director of Destination Delaware County Ohio, on Sweet Tooth’s inclusion. While they aren’t sure how their shop got included in the trail, Sue Bissonnette offered, with a playful laugh, her opinion on how their buckeyes made the list. “I like to think it’s because we have the most awesome buckeyes around,” she said. Large orders and custom work remain a significant part of the operation. Most of their cookie cutters are made in-house, and the ability to customize products with logos or specific color schemes makes Sweet Tooth an attractive partner for businesses, organizations, or even individuals looking to add a unique flair to an event. Sweet Tooth’s imprint has even expanded across state lines. Sue Bissonnette said they work with a company out of Baltimore, Maryland, that will send orders for cookies to be shipped to their new clients across the country. Of course, for the customer simply stopping in for a treat or two, there is always plenty of offerings daily in the case. Cake bars were added about a year ago, Steve Bissonnette said, as a way to increase variety and appeal to more people. After having spent two or three years perfecting the recipe, Sue Bissonnette has recently added a spiced molasses cookie to shop’s ever-expanding offering. Sue Bissonnette notes that her husband’s no-bake cookies have developed somewhat of a “cult following,” with people even becoming angry, at times, if they run out of them. Asked whether their success has led them to think about possibly expanding in the future, Sue Bissonnette said they are not interested in opening another retail location. She cites all of the work that goes into having a retail shop as one reason, but also pointed out how difficult it is to find a good staff, something she says she “hit the jackpot” on with her current staff. Like any business, there is a lot of labor that goes into operating the shop, but Sue Bissonnette is sure to point out that it’s work filled with a lot of love on their side of the counter.